The state unemployment rate dropped down in December, and a spokesperson for Iowa Workforce Development says the state is getting close to full employment. IWD spokesperson, Kerry Koonce, says the December unemployment rate hit 4.1 percent, compared to 4.3 percent in November. “Four-point-one percent is actually the lowest rate we’ve had since June of 2008. The national rate is still standing at five-point-six percent for December,” Koonce says. She says the national experts believe Iowa is getting close to what’s called full employment, or the percentage of the labor market that is able to find a job if they want a job. It is the third straight month that the unemployment rate has dropped. “What we’ve seen is we’ve seen a decrease in the number of people who are unemployed, plus a continued increase in the size of our labor force couple with adding 2,100 jobs to the economy in the month of December, that’s what allows us to bring that rate down continually,” Koonce explains. She says a large portion of the new jobs, 1,600 of themwere in manufacturing and another 500 still in construction. The state lost one thousand jobs in the trade and transportation area, which Koonce says included the retail sector. “You saw a lot of people leave at the end of the holiday season, plus the retail trade is just seeing a lot more people move to on-line shopping, so that just decreases the numbers they need in the actual stores,” she says. Local and state government saw the loss of 900 jobs in the month, but she says but many of these losses were seasonal transitions and should be recovered in January. Koonce says Iowa Workforce Development already is responding to help the Deere workers as they face the layoffs. 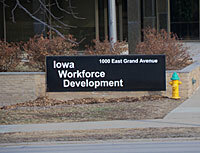 IWD says the total number of working Iowans reached a current-year peak of 1,642, 900 in December. This figure is 3,100 higher than November and 38,100 higher than one year ago.